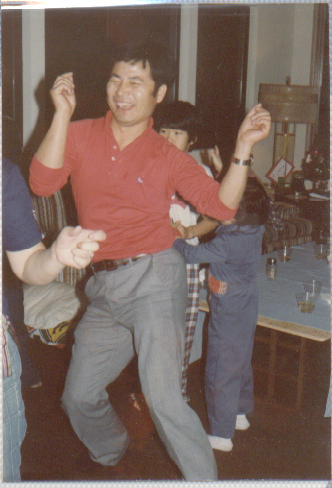 This photo of my dad is from circa 1982, in a cabin at Big Bear Lake, California. He’s about 43 years old here; I was about ten. He had just started a new business with my mom—a grocery store, of course—and things were going great. Our family—along with our family friends, all Korean immigrants too—was making really good money. We lived in a nice new house. We could easily afford group family vacations to Big Bear. There was a lot to dance about. I think it was mostly disco back then. My dad grew up dirt poor. So he was really dancing to celebrate never going hungry again, having kids who would never get their hands dirty, living life on his own terms, and mastering this weird new country of America. I’m proud and amazed by everything Dad managed to accomplish. I will carry on his crazy dance for as long as I am able. Peter Merholz, founder of Adaptive Path (remember them? The budding UXer in me used to worship that company) and inventor of the word blog, dug up an old manual for the original 1984 Apple Macintosh. It’s incredible how many basic things needed to be explained back then: graphical file systems, moving stuff around with a mouse, and (see pic above) the concept of scrolling. These days, all we do is scroll scroll scroll. And we do it without even thinking about it. I lived in Japan for four years and always wondered how to do this. Now I do. Thank you, internet! I love this video: Apple's "Share Your Gifts"
Absolutely beautiful, absolutely meticulous animation and art direction from Apple. If you do anything creative, you probably know (like I do) that sharing your work with others is the scariest thing ever.